Fold and display papercraft works of art with this intermediate to advanced origami book. 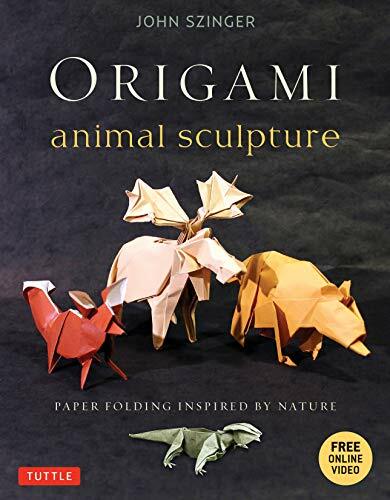 Adirondack animals, cephalopods and arctic marine mammals are just a few of the realistic and elegant origami models you'll be able to fold with this unique book. Origami Animal Sculpture offers a refreshing take on the endlessly fascinating field of animal origami paper folding. In this book, folders will find beautiful photos, clear directions and an instructional DVD that make the creatures in this new collection a joy to fold and display. All videos are also streamable or downloadable online. Author John Szinger has put together expressive lifelike 3D origami with intermediate-to-advanced models of unusual animals and related objects. This origami book contains: 128 page, full-color book 22 original origami models Step-by-step instructions Colorful diagrams and photographs Origami folders will find that the sculptures they create are customized to exhibit the subjects' personality and attitude. Szinger's attention to detail is the hallmark of his work. He's been folding paper for most of his life, starting with paper airplanes at a young age. He devoured origami books at his local library and soon began experimenting with his own designs. Ten years ago, Szinger came back to origami after a long hiatus and began attending conventions, where he met other dedicated folders and was inspired to create his own original models. From these encounters, he began to fold origami pieces for personal enjoyment and to share with other origami makers. Origami models include: Foxy Fox Brown Bear Octopus Giant Squid Bull Walrus Elephant Seal Narwhal Inchworm Butterfly And much more!